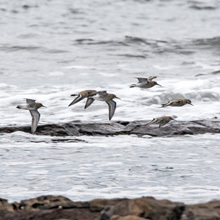 A Tweet reporting Mediterranean Gulls and Long-tailed Duck at Meikle Craigs, Troon, tempted us to drive to the west coast this week. The weather there was predicted to have been better than the in the east, so it was all good. After our usual excellent Kilmarnock ASDA breakfast we soon found ourselves picking our way through the inevitable dog walking hordes to the rocky outcrop that is Meikle Craigs. The site we stopped to observe was relatively free of walkers as they seemed to prefer to stay near to the dunes. 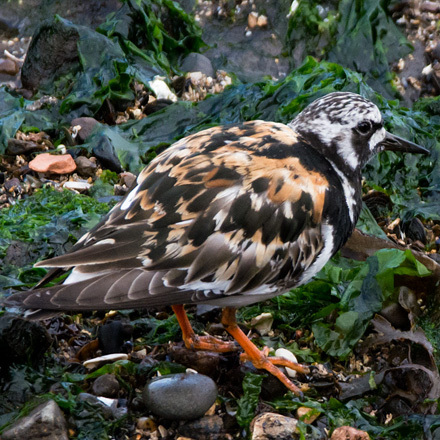 The tide was incoming so the birds were fairly active. 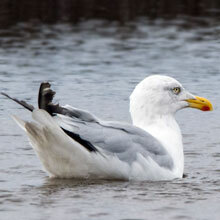 A large Herring Gull rested in a small rock pool close to a more skittish Black-headed Gull which flew off as we got closer. 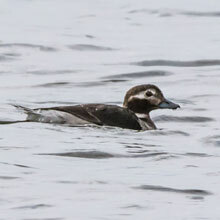 Just 20m out we spotted the Long-tailed Duck, probably female, diving repeatedly for long spells. It feeds on molluscs, crustaceans and small fish and can dive to depths of 60m, although where it was was certainly a lot shallower. 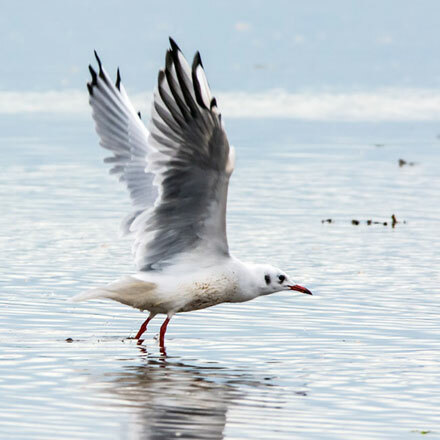 A bit further out a half-dozen or so Mediterranean Gulls were clinging to a large rock that was steadily disappearing beneath the advancing tide. 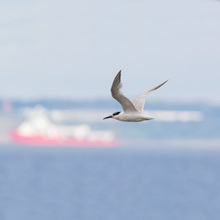 The familiar creaking cries of Sandwich Terns started to fill the air. We struggled at first to locate these small exciting diving birds but eventually we saw them on the east side of the Craigs. 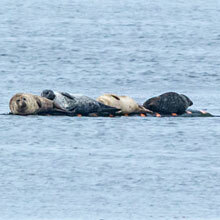 Occasionally a few passed close enough for a decent shot, although the light had been steadily getting dimmer. All this time the advancing tide had been pushing us back further from the Craigs so we decided to move round to the Harbour area car parks. 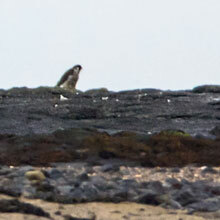 These give superb sea views and the rocks often throw up some delights such as Sammy the Seal. 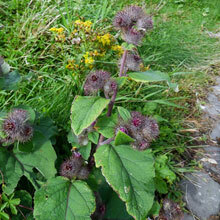 As we sat scanning the rocks I noticed beside us a patch of Lesser Burdock which was just coming into seed. 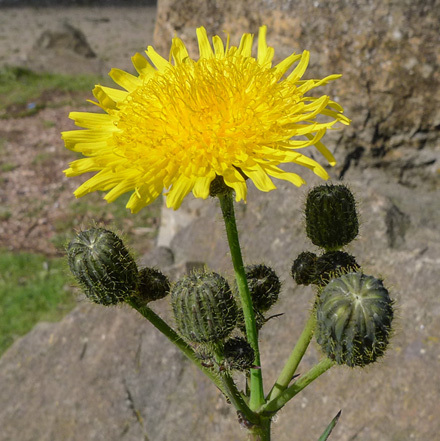 It is commonly mistaken for thistle but burdock has large heart-shaped leaves and velcro-like hooks on its flower-heads. 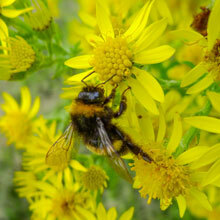 Also close by a clump of Common Ragwort was host to a very busy pollen-coated White-tailed Bumblebee. 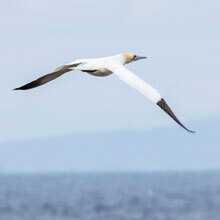 We sat transfixed by its efforts but every few minutes a Gannet passed though never close enough for a really good shot. We went a short stroll along the rocks hoping to see Sammy. 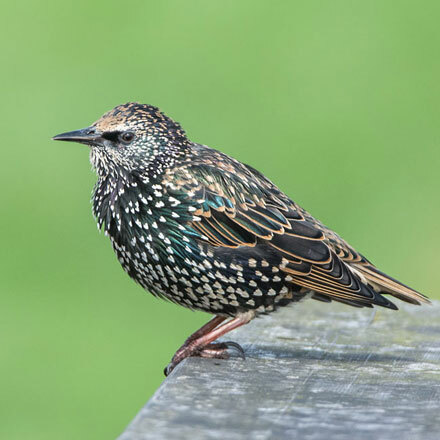 He didn't show but we did get lovely views of much-maligned Starlings, their iridescent plumages shining in the strong sunlight that had at last decided to warm us. 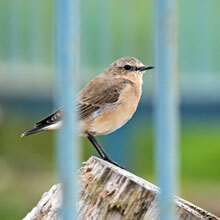 As we returned to the car we had a final surprise when we caught sight of a solitary female Wheatear dotting about the edge of the car park. 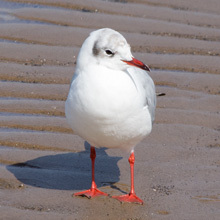 This bird’s name is derived from its white rump (or “white-erse”). Our final stop was at Irvine Harbour. 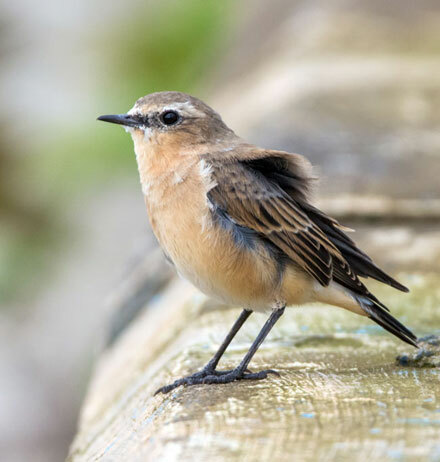 Before we had tea and pastries we went a short walk to the mouth of the river where we came upon yet another female Wheatear that came even closer (see Pictures of the Week” below). 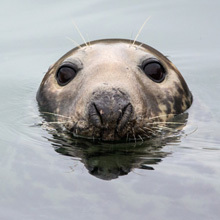 Just as we were finishing our walk our wishes were finally granted when we noticed a group of four seals in the distance on a platform in the mouth of the River Garnock. Just a pity they were so far away. 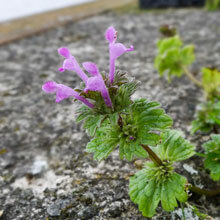 As a final bonus, at my feet below the Harbour side railings from where we were viewing the seals, I discovered a very small but attractive plant, Henbit Deadnettle. 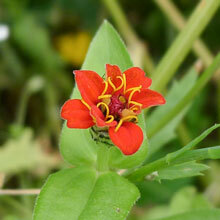 It is probably native to the Mediterranean region but has spread throughout much of the world. 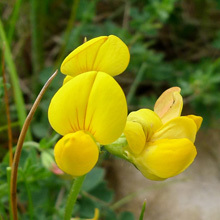 Its flowers and leaves are edible and tastes similar to celery. A first for me. So our trip ended with a newby, and Sammy showed up with his pals, so our tea and pastries went down well. It was back to the Dunbar area this week. 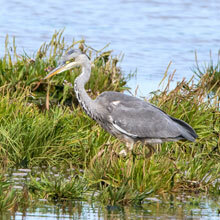 No particular target – we just hadn't visited Belhaven for a few months and it can often throw up unexpected goodies. 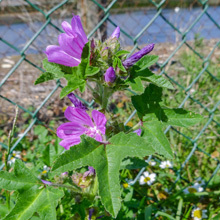 A pretty patch of Common Mallow was the first goody to catch our attention. 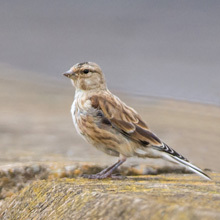 It is fairly common along the Lothian coastline. The tide was well out, but coming in steadily. 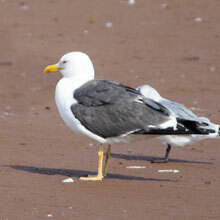 A Lesser Black-backed Gull and a Great Black-backed Gull were standing 40m off the seawall. 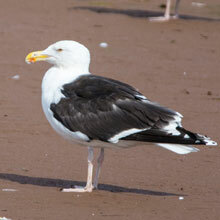 Identification tip: the “Lesser” has yellow legs and a dark grey back while the “Great” has pink legs and a black back. 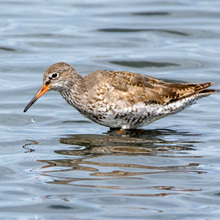 A few thin-looking Redshanks flew in away from a rampaging dog. They turned out to be juveniles. 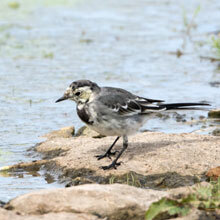 We arrived at Seafield Pond and were disappointed to find there were relatively few birds. A couple of Mallards were dabbling on the grass. 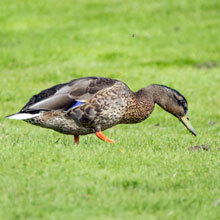 Mallards are very common and are consequently underrated – not by me though as I think they are very good to look at. 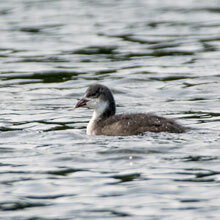 A juvenile Coot was trailing behind its parent on its never ending quest for food. 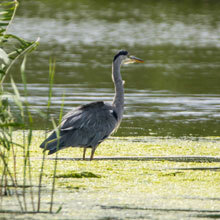 A young Grey Heron stood in the sunshine silhouetted beside the reeds as a tiny Little Grebe was diving in the middle of the pond. 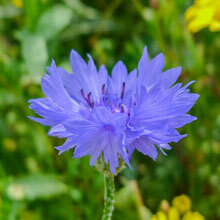 Beautiful blue Cornflowers were dotted randomly throughout the garden. 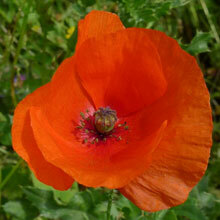 A pretty scarlet flower, as yet unidentified, stood out beneath some Red Poppies. 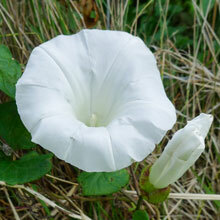 There were also large blooms of Hedge Bindweed. The garden, though wild, had the look of the seed packed about it, but it didn't matter to the many insects living there. 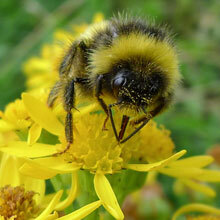 Certainly the Buff-tailed Bumblebees were single-mindedly flitting randomly from flower to flower. 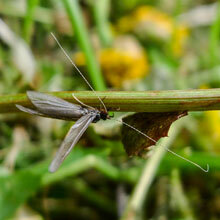 John spotted a disabled Caddisfly crawling up a flower stem, one of its wings bent sitting at an unnatural angle. 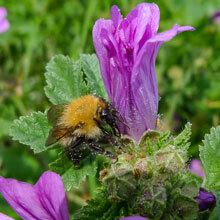 Another type of bumblebee we saw were Common Carder Bees – the only common UK bumblebee to be entirely brown or ginger. 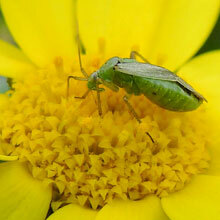 A Common Green Capsid was probing the Corn Marigold is was sitting on. 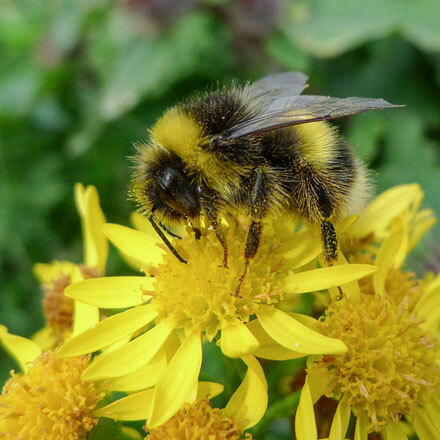 This bug is not the gardeners pal though as it can damage leaves and flowers in a number of way including injecting poisonous fluid into the plants sap leaving the plant discoloured and distorted. 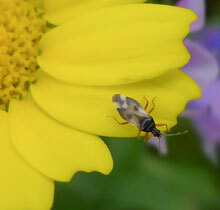 I had to look closely at another another Corn Marigold before I noticed a Common Flower Bug. 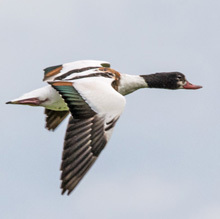 Its jazzy angled markings look to me as if they were painted by modern artist. John was equally impressed by the markings of a Common Nettle Tap moth which he thought had a purplish hue. 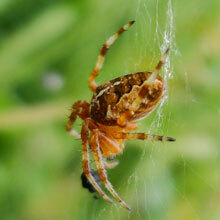 Waiting, I dare say, to munch any of these insects was a European Garden Spider. 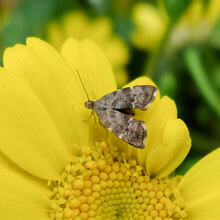 The grey and a bit hairy fly, Helena Reversio, was dining on another Corn Marigold as if oblivious to the 8-legged threat only inches away. 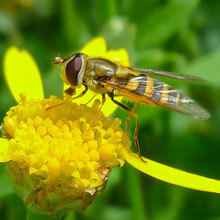 On yet another Corn Marigold the handsome little hoverfly Syrphus Ribesii took a brief rest, allowing me to record its image for this blog. 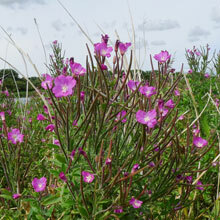 As we moved back to the seawall we passed a patch of Great Willowherb by the Pond. 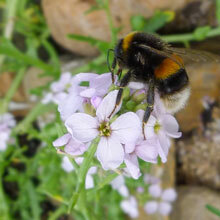 Other common names for this tall plant include – great hairy willowherb, codlins-and-cream, apple-pie and cherry-pie. 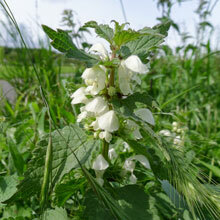 Along the path we noticed many instances of White Deadnettle whose leaves look very like the more common Stinging Nettle, but without the sting – hence the name “dead” nettle. By now seawater was up to the seawall. 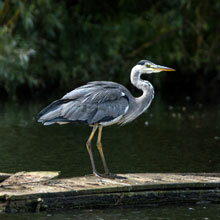 A Grey Heron stood motionless some 50m away probably pondering its next move. We picked up a message on Twitter that a Marsh Harrier had been spotted by the nearby Whitesands. We headed there quickly but we did not see said Harrier. 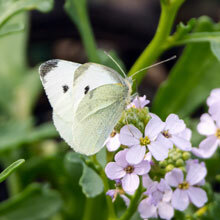 However, I managed to photograph a few more insects on the very plentiful Sea Rocket. 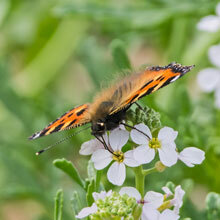 First a Buff-tailed Bumblebee, followed by Large White butterfly and finally a Small Tortoiseshell. 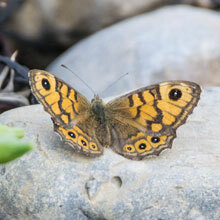 A fairly fresh-looking Wall Brown butterfly got close enough for a couple of shots with my long lens. 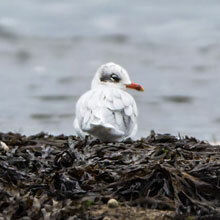 Disappointed with the lack of birds we moved on a mile eastwards to Barns Ness. 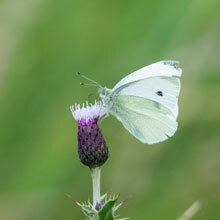 As we left the car park I snapped another Large White butterfly on Creeping Thistle. 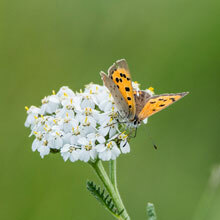 Nearby on some Yarrow I got a picture of a Small Copper butterfly. Eventually we reached the sandy beach to the east of the lighthouse. We sat there optimistically letting the birds come to us. 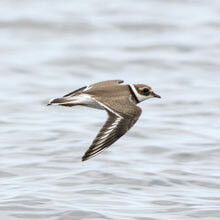 A Ringed Plover noticed us and winged it swiftly, followed by what we thought might be a Golden Plover. 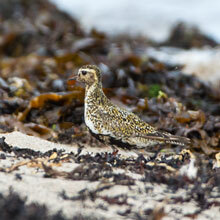 We were still debating this when I noticed another Golden Plover about 30m away. 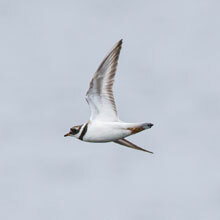 The Plover, a relative of the Lapwing, is so-called as it was thought they appeared when it was going to rain - “pluvia” is Latin for rain – hence “plover”. 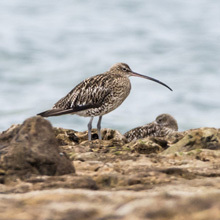 Satisfied, we set off back to the car only to come upon large flocks of Curlew, Dunlin and Ringed Plover brought close to dry land by the incoming tide. 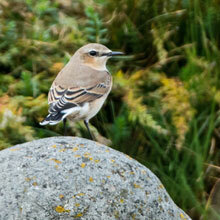 Amongst them we spotted a couple of female Wheatears that were keeping us under surveillance as we observed the waders. Back at the car, over tea and Danish pastries, we were well-chuffed with our collection of pictures. 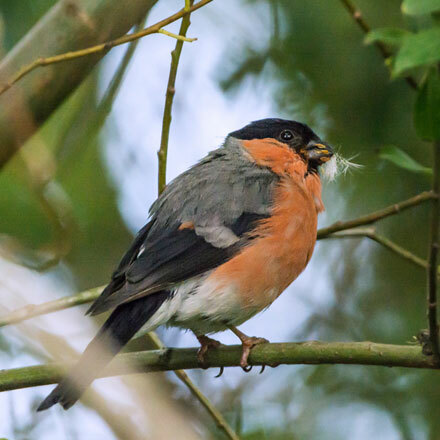 We certainly had a few goodies, some of which were unexpected, such as the Golden Plover and the Bullfinch. 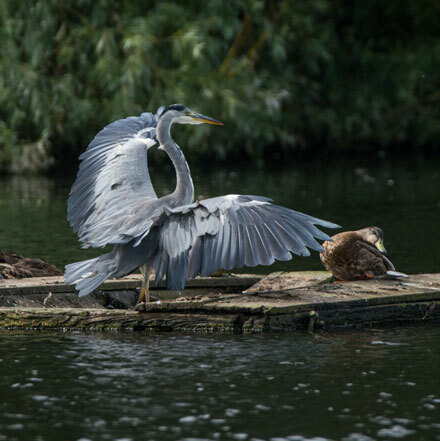 Below are some of our favourite images from the day. Our destination of choice this week was Musselburgh. 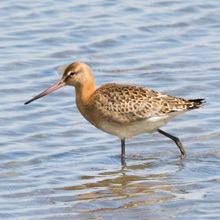 Twitter posts were reporting there were Black-tailed Godwits, Greenshanks, Green Sandpipers as well as lots of the more commonly seen birds. We parked at the Esk mouth and set off in bright sunshine. 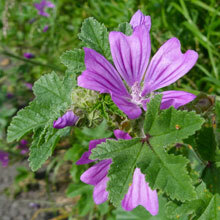 I snapped an image of some Common Mallow by the banks of the river. 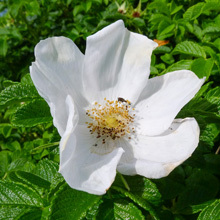 The leaves contain mucilage – glue-like sap that is a soothing agent in treating bites and stings. 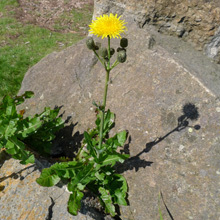 At the start of the promenade Perennial Sow Thistle and Yarrow plants also caught my attention. 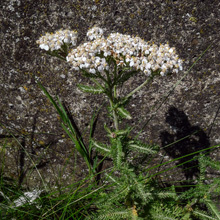 Yarrow is a powerful 'healing herb' used typically for wounds, cuts and abrasions. 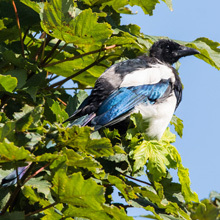 A scrawny Magpie sitting basking in a neighbouring tree paid us no heed as we made our way east, heading for the scrapes, Levenhall Links. 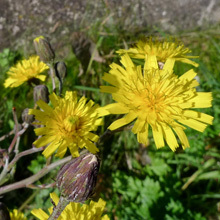 With flowers looking similar to Sow Thistle, an impressive, tall Broad-leaved Hawkweed plant was next to be photographed. 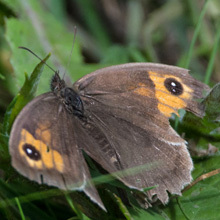 Beside it a tatty Meadow Brown butterfly flitted into view and came to rest on some grass where I managed a quick shot. 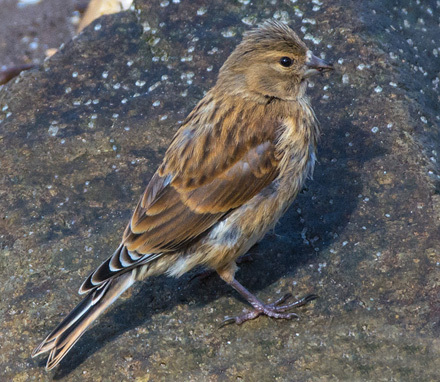 Next, a female Linnet sat perched on a rock below the seawall. 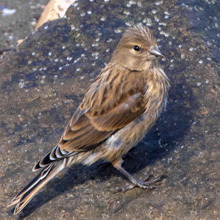 The name “linnet” is apparently Welsh and means “idol”. 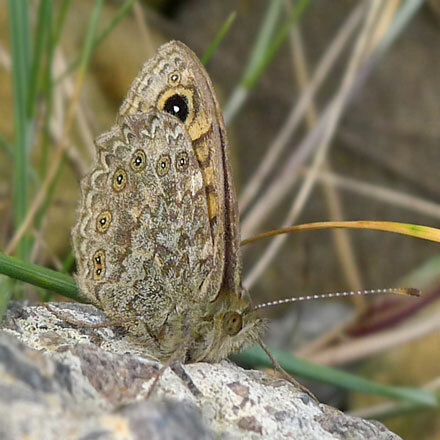 Whilst recalling this fact I was startled somewhat by a Small Copper butterfly that abruptly appeared on the wall just in front of me. 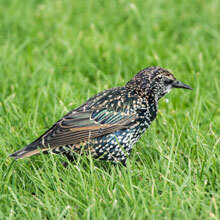 I just managed a picture of it by using a Ninja-like approach with my camera. 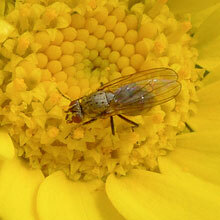 This little fast flier’s big cousin, the Large Copper, went extinct during the 19th century. 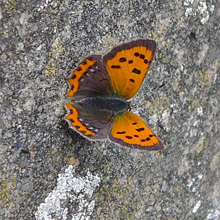 Inevitably I spooked the Small Copper only to come across a well camouflaged Blue Mason Bee as it probed the many tiny holes in the wall. 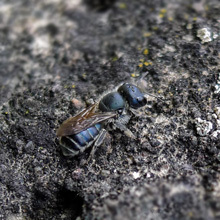 It was probably looking to use its building or " masonry " skills using using mud and small stones to prepare a nest in the cracks or pits in the wall. 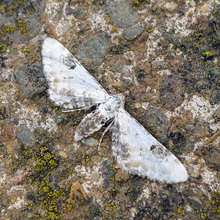 As I stalked the Bee, a Lime-speck Pug moth fixed itself to the top of the wall looking to the casual glance very much like a bird dropping. 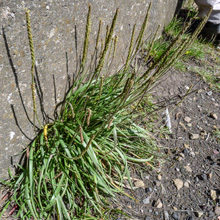 Next we came upon a patch of Sea Plantain. 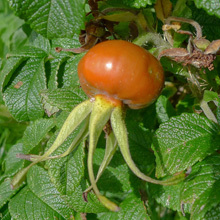 In some parts of the world the leaves and seeds of this plant are eaten. The seeds can be ground into flour. 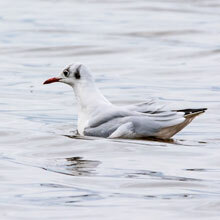 As we slowly progressed east a lonely Black-headed Gull stood motionless on the sand. We saw lots of white birds in the distance diving into the sea. 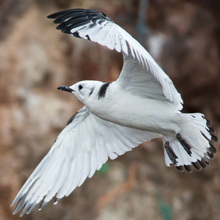 They were Gannets and Terns, and by the creaking calls, Sandwich Terns. 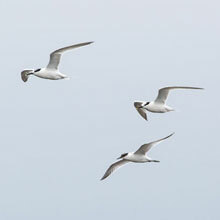 These Terns, named after Sandwich, Kent, are also identifiable by the yellow tip to their bill. 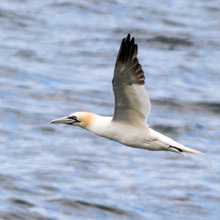 The Gannets were probably after the Mackerel while it was likely the Terns were hunting Sandeels, Sprat or Whiting. 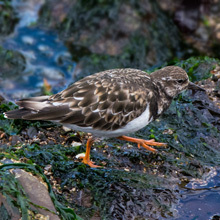 Below the seawall adjacent to the Scrapes I spotted some Turnstones foraging along the rocky shoreline. 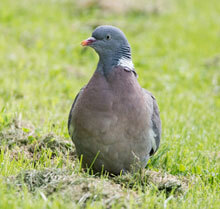 Apparently they are opportunistic feeders and will feed on a very wide range of foods – even dead humans! Hopefully they seldom taste that delicacy very often at Musselburgh! 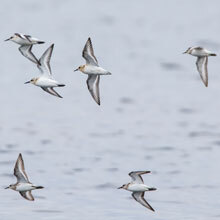 When we arrived at the middle hide of Levenhall Scrapes we were pleased to see there were quite a lot of birds – even although the tide was very low. 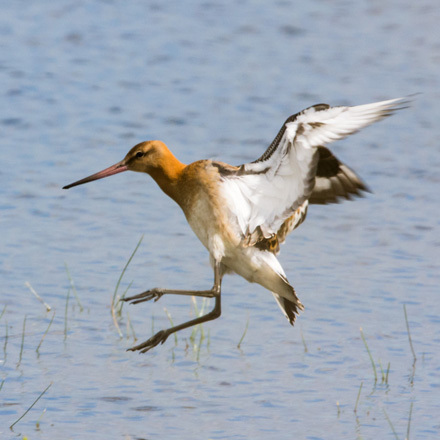 Closest to the hide were Black-tailed Godwits. 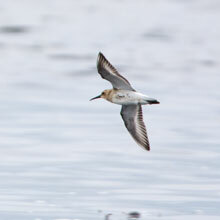 These were probably from Iceland and may have stayed briefly before moving on as far south as Morocco. 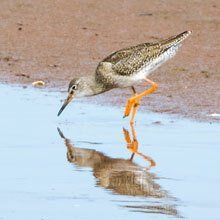 Just as I captured images of one of the many feeding Redshanks, a family of Shelduck flew in. 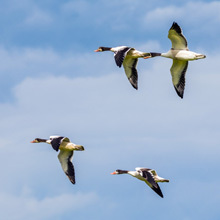 The flock was made mainly of juveniles. 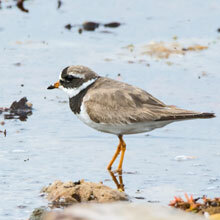 As I photographed them I noticed a solitary bird resting on a solitary green leg (or “shank”). 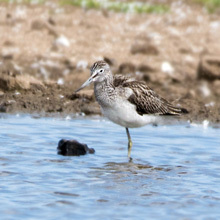 It was a Greenshank sleeping at the back of the most easterly scrape. 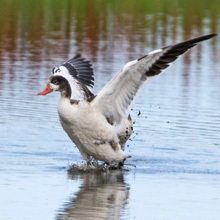 Suddenly the Shelducks took to the air and circled the reserve several times before resting on the middle scrape. 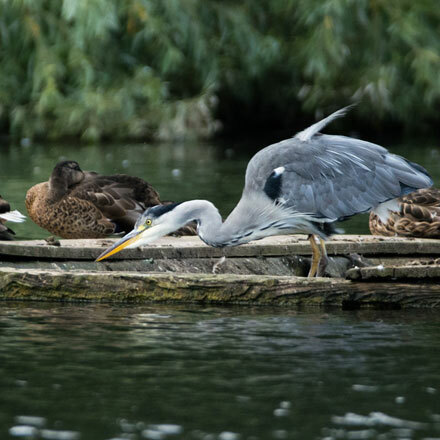 They feed on small invertebrates, small fish and even amphibians – so perhaps these were in short supply in the other scrape – or, maybe like our youngsters, they were just restless and impatient. 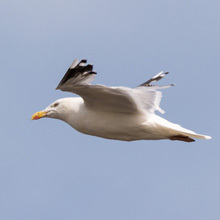 On our return journey back to the car we seemed to have been followed by a large Herring Gull (Larus argentatus - Latin for “silver-decorated gull”) probably looking for easy pickings. 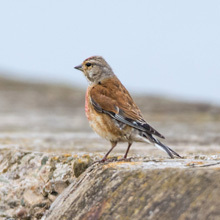 A pair of Linnets, adult male with juvenile, on the seawall seemed to toy with me as I tried to edge closer to them to get a better shot. 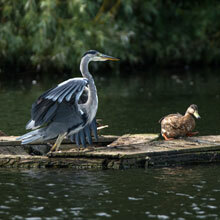 They fled a little further away each time I tiptoed nearer to them. 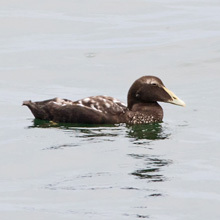 As the light worsened, my final capture was of a juvenile male Eider hunting on its own not far off the seawall. It was back to the car and very tasty Apple Lattice pastries with our teas, followed by a homeward journey listening to the first Sunday EPL football of the new season. Already? We found ourselves at Skateraw, with view to the east dominated by the Torness nuclear power station – so it's lovely if you look north, south and west! The weather was dull and mild with the odd shaft of sunlight. 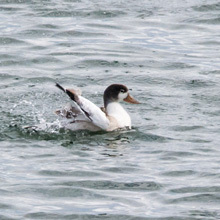 Our first sighting was of a family of Shelduck we had first seen a month or so ago. 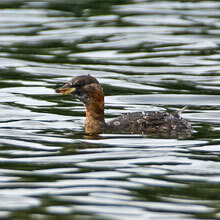 Of course the chicks were now a lot bigger and fewer – we counted only 4, about half seemed not to have made it. We set off for a walk around the bay. 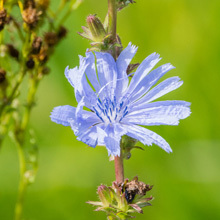 In the field adjacent to the beach I spotted many Chicory plants with their bonny blue flowers. 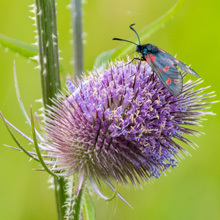 Amongst them a Teasel head was being feasted on by a 6-spotted Burnet moth. 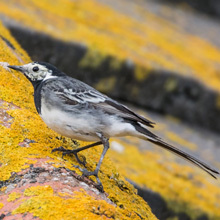 As we passed the house a Pied Wagtail landed on the roof and watched that we had passed before returning to the beach to forage. 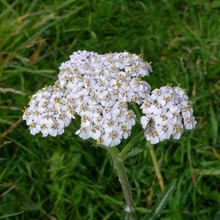 Further along I saw some Yarrow beside a patch of Wild Roses, many of the flowers having turned to hips. 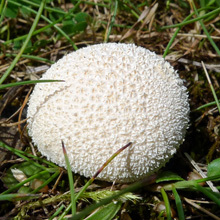 I photographed a fungus, Peeling Puffball that was nestling the short grass. 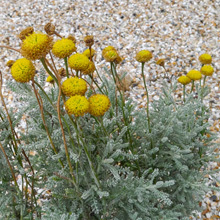 At the sea shore by the monument at Chapel Point I was snapping some shots of Common Knapweed when a female Shelduck passed overhead. It was probably the mother of the family we'd seen earlier. 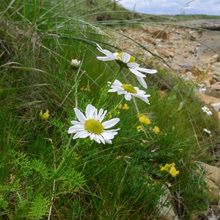 On the rocky shore Sea Mayweed and Birdsfoot Trefoil were nestled in spots sheltered from the wind. 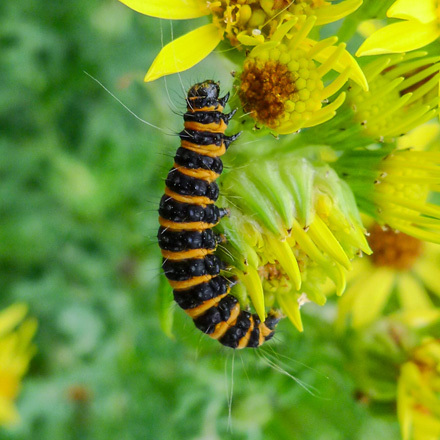 On Common Ragwort John spotted Cinnabar moth caterpillars (see Pictures of the Week, below). 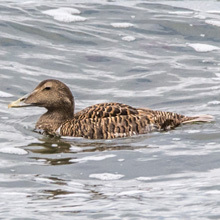 Offshore a lonely female Eider sat bobbing up and down in the sea. 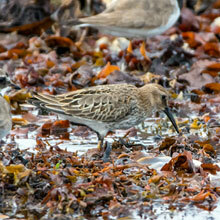 A few Sanderling darted past it as they sought a better roosting position on the rocks. 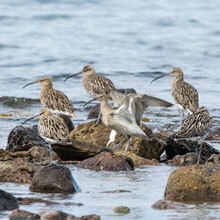 Already anchored to the large expanse of rock were some Curlew who were just far enough away from the advancing waves. 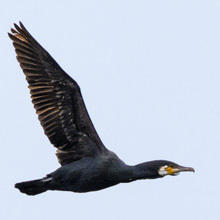 A large Cormorant had similar ideas as it flew in from the sea. 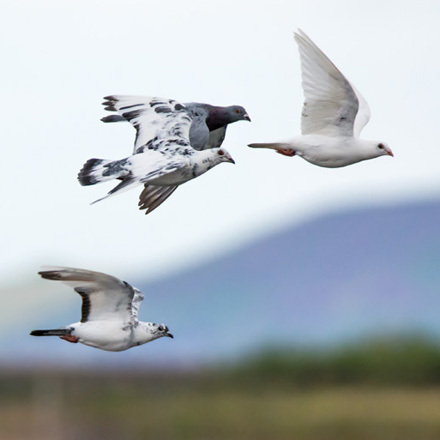 As we headed back to the car we were overtaken by a flock of Feral Pigeons speeding around the bay (again see Pictures of the Week, below) We decided to nip round to Dunbar Harbour as it was a nice place to have our tea. When we arrived we were a bit early for tea so we had a wee stroll around the Harbour to see what we could see. 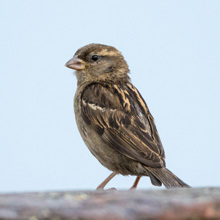 A female House Sparrow sat obligingly on the sea wall as I tried my best to get a good picture in the now quite gloomy light. 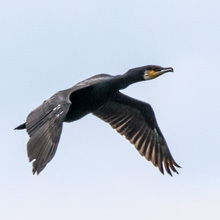 A juvenile Cormorant made a fly past travelling in from its roost on the offshore rocks. Young Kittiwakes were testing out their flying skills around their nest sites on the Dunbar Castle ruins. 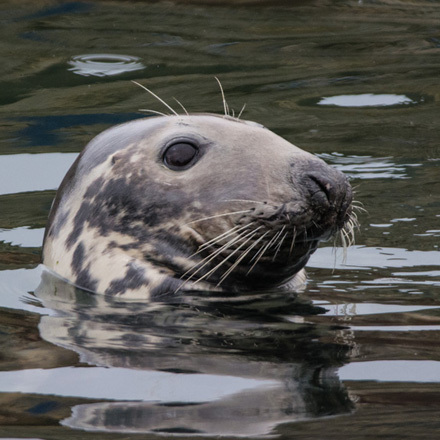 In the Harbour a fishing boat had just come in much to the interest of a pair of Grey Seals. 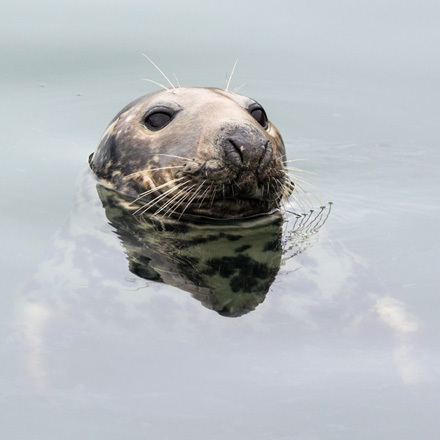 They were in luck as the fishermen chucked scraps of fish overboard – this was much to the interest of the assembling crowd of tourists who delighted in watching the seals’ antics. We noticed that Dunbar Battery was reopened after refurbishment. 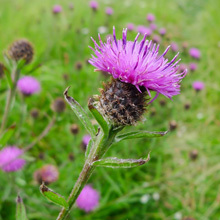 Amongst a number of changes was the addition of a coastal garden (see https://dunbarbattery.org.uk/the-location/coastal-garden/ ). 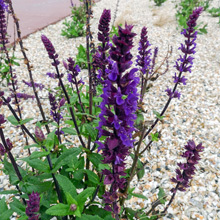 Of the many plants there only a couple were in bloom, Caradonna Meadow Sage And Lavender Cotton. 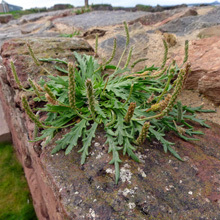 Not intentionally included in the developers’ plants list was the Buckshorn Plantain growing on the Battery walls. Pretty in its own way. 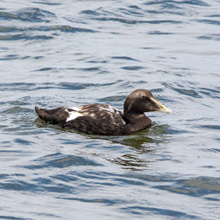 On our way back to the car I noticed a lonely juvenile male Eider lurking on the harbour water.